...did I have a great Thanksgiving? You bet! 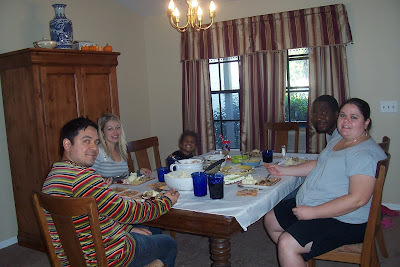 Here's a picture of my family just as we sat down to partake in the feast. My daughter and I fixed dinner. It was a nice bonding time for us. And of course little Alivia had to help, so we let her make the fruit salad. My niece brought the pies and home made pumpkin cookies. Her talents in the kitchen are next to none but she did a terrific job on the cookies. I tried to get dad to hop on a plane and come for the weekend but he decided to stay with my sister and her hubby in North Carolina. 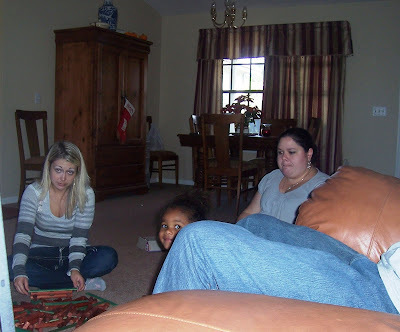 It would have been nice if we'd all been able to get together like we used to do when my mom was still with us. I hope y'all had a wonderful holiday, too. How many of you went shopping on black Friday? My daughter got up early to meet some friends and they hit Wal-Mart for the sales. Not me! I slept in with Alivia. We had a good Thanksgiving. My stepdad ended up not getting to come because of a blood sugar problem so my mom and he stayed home. But the rest of us all gathered and stuffed ourselves. I didn't get out at all yesterday. There aren't enough bargains in the world to get me out on Black Friday. Yep...I feel the same way Nancy. People act crazy during the holidays and I don't need the added stress. Except for what I buy my granddaughter my shopping is done online. Thank God for computers!